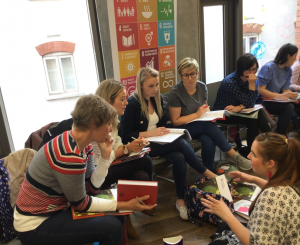 Last October we trained 85 teachers across Ireland through our Educating the Heart Programme. Since then, we’ve been continuing to support those teachers as they bring their learning to the heart of their classrooms, using the new tools and knowledge to cultivate Compassionate Global Citizenship. As well as drama methods, new tools, and a pupil pack, the training gives teachers space to reflect on their own values, to upskill in compassion-based and development education practises and to consider the ways they can bring global issues to life and prepare their students holistically to participate in the world as a change maker! Our training supports teacher’s professional learning and offers accreditation for teachers who implement the programme to bring the Educating the Heart approach into their practice. We’re are over the moon and full of pride to have received the OCN portfolios this week; the standard is incredible, and it’s clear to see reflective practice, growth and transformation in the submissions. Children in Crossfire want to see a word that is fair, kind and compassionate; a world where we prioritise human need, over human greed. A world that values all life on land and life below water and where human rights are realised. Find out more about Educating the Heart or register your interest for our upcoming Dublin and Wexford training.